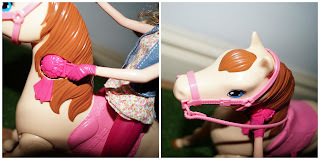 Life with Liv: Barbie Saddle N Ride horse review. Barbie Saddle N Ride horse review. This is not Barbie and her horse as we know it! This is a whole other level! Why? After a quick setup, and the press of a button Barbie will mount her horse while the horse begins to trot off, beginning their ride together! To set up you simply need to clip Barbies gloved pink hand into her horses mane, move the arm that is clipped in to the left, stand Barbie on the ground then simply push the button on the top of her horse's mane. Barbie will then flick up into the pink saddle while the horse starts walking on her own. Simply press the pink button to release Barbies hand and she could take the horse for a walk on foot. Barbie - as always - is dressed perfectly for the occasion, wearing a patterned tunic, denim waistcoat, pink trousers (non-removable), knee length brown riding boots and of course a pink safety helmet. Not to be outdone, the beautiful horse is sporting a fuschia pink saddle and reins. The initial set up takes a couple of tries to get used to but once you know how it can be set up in a few seconds. Liv has just turned 4 and she is easily able to do it by herself once she was shown how. This Barbie play set has been a hit in our house, Liv has played with both Barbie and Horse daily since they arrived. A must have Christmas gift for any Barbie lovers! Livs new Micro Scooter - review. BT Video Baby Monitor 7500 Lightshow review. Poundland - for all of your Halloween needs. Preparing for Halloween with Morrisons. Sharing the Stokke Tripp Trapp® love. Choosing the right bed for your Children. Things to consider before getting a Dog. Tips for investing in your smile. The best way to choose home exercise equipment.